Benington (blue) v Horncastle Town (red). Gavin Bell (blue), George Leverton. Mickey Stones praised the ‘two moments of quality’ which saw Horncastle Town book their place in round four of the Mason Bros Lincs Junior Cup. 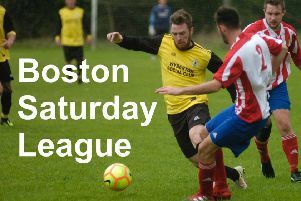 The Wongers stated that the knockout competition was their top priority this season, but they were made to work for their win at Boston League Benington. However, goals from Jac Wright and Luke Blondel were enough to secure a safe passage. Wright opened the scoring in the 66th minute with a near-post header, while Blondel’s volley, after teeing himself up with a cushioned first touch, doubled the advantage with 10 minutes to go. “It was two moments of quality that won it for us in a game that didn’t really have a lot of quality,” Stones said. “It was a real battle but I’m pleased we came through it. “It was a difficult game, but good to get the win. That was important. A stoppage time finish from the hosts set up a nervy final few moments, but the Wongers held on for the win. While Stones was delighted with the result, he felt his side could have offered more in the opening 45 minutes. He said: “They made it difficult for us. “There’s a ditch down the side and they were happy to let the ball run down there and let us fetch it. “It seemed to be a bit of a tactic to kill time and make us do the work and the ref didn’t do anything about it. “In the second half we stood by the ditch and stopped the ball going down. The next round will be played on January 5. The Wongers are without a fixture this week.